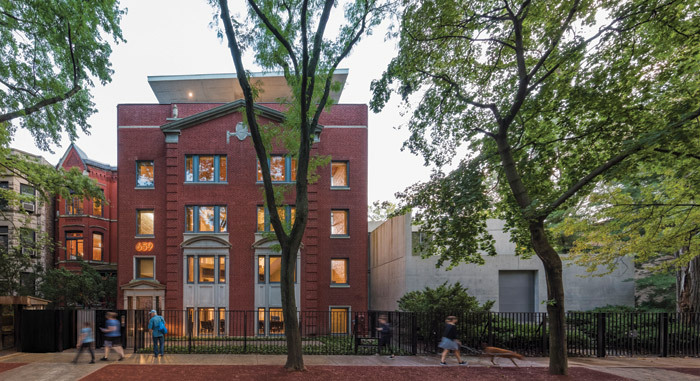 From the get-go, it’s clear Wrightwood 659 is a different kind of home for art in Chicago; a less austere, more joyous thing inserted into one of the lovelier blocks in the upmarket neighbourhood of Lincoln Park. 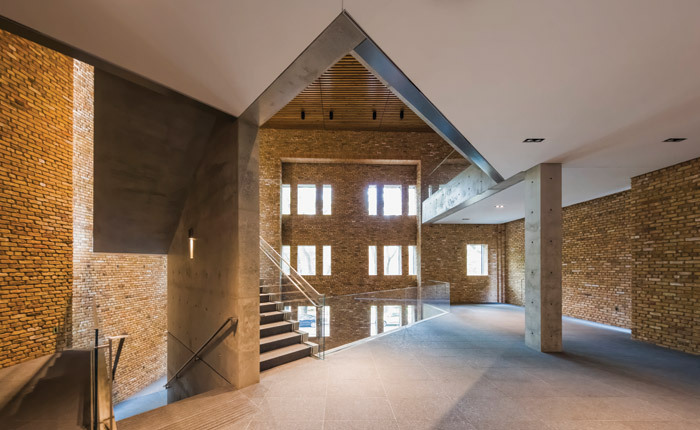 Gallery space given the purpose — and budget — of a fine art museum, the rooms for traditional art viewing are coupled with a dramatic yet welcoming shared space in a bold transplant of gestural, concrete minimalism into a neoclassical, 1920s apartment building shell. Eychaner and architectural historian Dan Whittaker founded Wrightwood 659 as a private, noncommercial venture for the exhibiting of architecture and socially engaged art. Eychaner purchased the 30-unit Lincoln Park residential building bordering his private home in 1997 and ran it as a landlord. Eventually though, concerns over upkeep and safety led him to begin pondering other uses for the building. 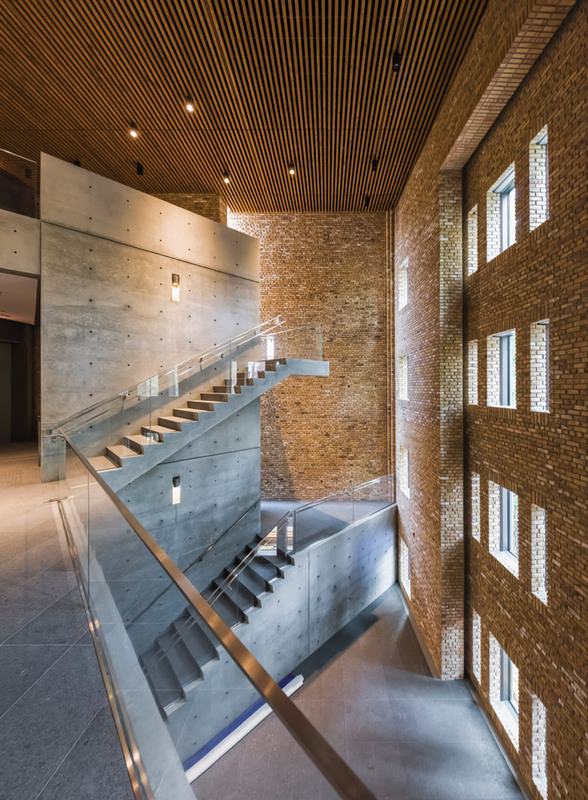 He sought the advice of Whittaker on how to repurpose the structure as a cultural asset — and turned to his architect of choice, Tadao Ando. For client and architect, this was not their first rodeo. Ando was hired in the early 1990s to design Eychaner’s home, a poured concrete form so fixed as to seem a spur of the earth. Completed in 1998, it was the first freestanding structure by the Pritzker Prize-winner in the United States. Jumping to 2013, Eychaner made the first of several trips to Japan to meet with Ando’s team and hone a design vision for recasting the 90-year-old apartment building as a space for contemporary art and architecture. Fans of Ando’s brand of modernism will recognise some of his classic moves in Wrightwood 659. Concrete planes slice through humbler historical structure, shaping galleries and articulating the void, while the entire provocation is hidden behind a vernacular style. 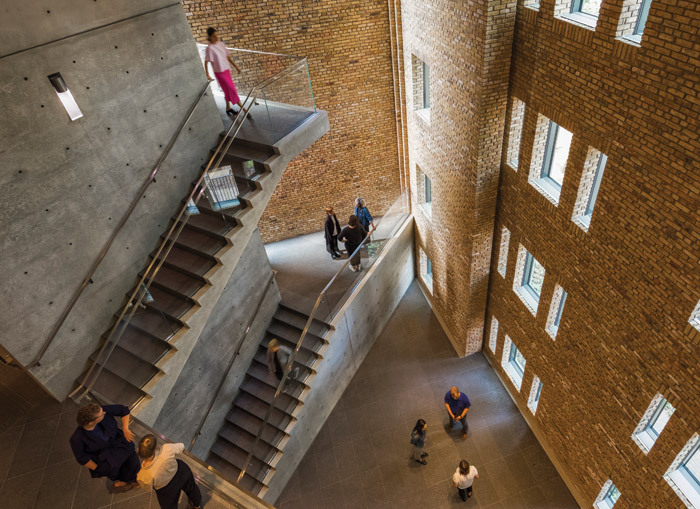 Preserved elements of the residential go beyond the grafting of 25,000 reclaimed bricks on to the atrium firewalls and a reconstructed facade. Ando strived to maintain a residential atmosphere and scale throughout, even while drawing from his deep portfolio of work in the cultural sector. The creative freedom given Ando is acutely felt in the end product. One experiences the building as a series of compressions and decompressions, entering through a heavy gate and snug foyer, then bursting into the triple height atrium, funnelling through the rectilinear gallery block, and finally culminating in a generous glassed-in roof where one can scope the neighbourhood through treetops. The atrium rises 11m, punctuated by Ando’s showstopping floating staircase which weaves up a reinforced concrete core. Rather than tearing down the building and starting from scratch, Ando chose to strip out the four-storey interior to rebuild three levels with gallery-appropriate ceiling heights. A new protruding fourth level with a reserve of sky-lit exhibition space and enclosed terraces came as a complete surprise to the client. According to Ando, the goal with the addition was to add a bonus level of programmable space and a perimeter of porch set back from the roofline so as not to disrupt the original appearance of the building on the street. Eychaner doesn’t seem to mind that visitors peer down to his property. 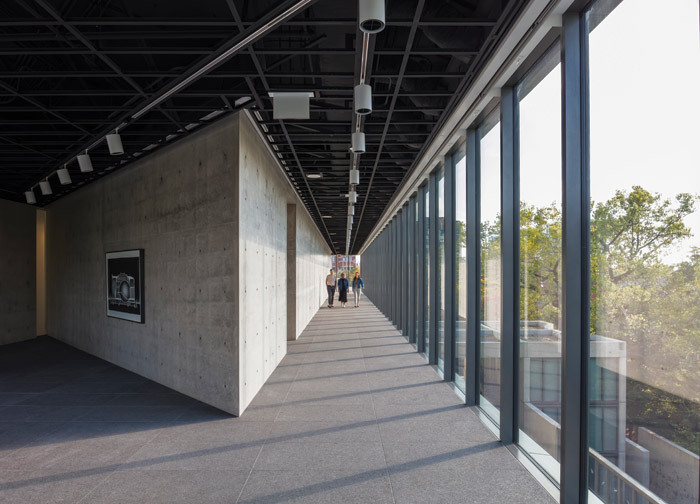 Following a soft opening of Ai Weiwei works last summer, Wrightwood 659 officially opened in October with a threelevel show, Ando and Le Corbusier: Masters of Architecture. The first gallery level, curated by Washington University architecture professor Eric Mumford, is brimming with seldom-seen scale and abstract models of famed Corbusier residential projects from his early pops of modern infill in Paris to his transformative Unité d’habitation housing blocks. Paintings, sketches and photos are interspersed, and most memorably, a circuit rail featuring 100 miniature Corbusier home models fills out the back of the gallery. A mixture of built and unbuilt projects, all were assembled by Ando’s students in 2001. They are not so precious as to be under glass, lending the area an almost active studio feel. The two upper levels of the show, curated by Whittaker, encapsulate Ando’s career told again with models and photography. 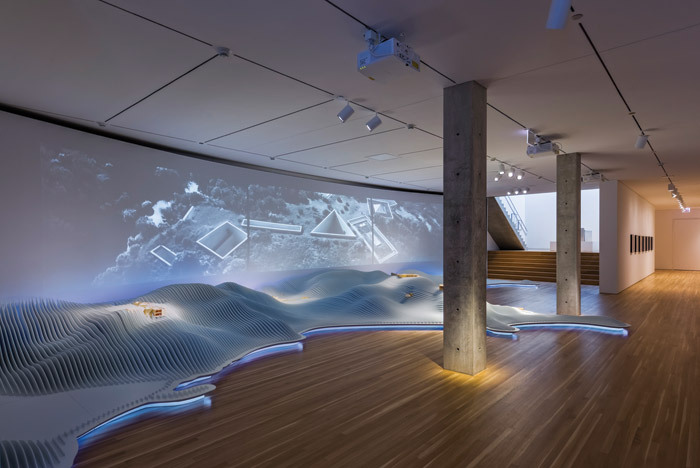 Highlights include a scale model in cast concrete of the architect’s famed Church of the Light and a trio of US museums by Ando modelled anew by local university students in Chicago. Upcoming exhibitions look to fulfil the venture’s stated mission of putting forth socially engaged art. ‘We want to create a dialogue among groups of people around salient issues in society, and do it in a very civilised fashion,’ says Wrightwood 659 director Lisa Cavanaugh. 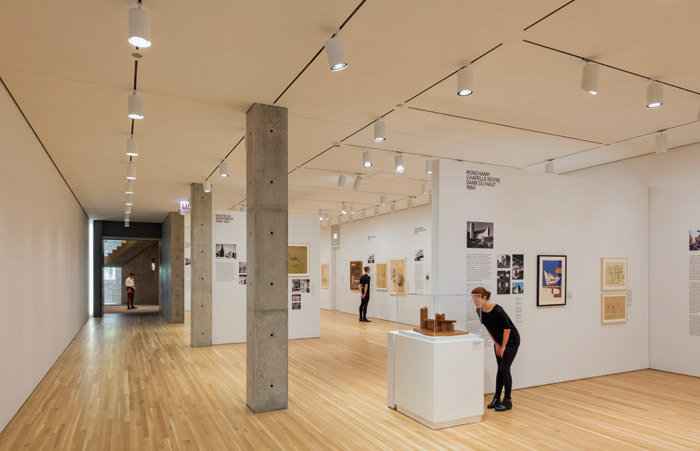 For 2019 and into 2020, expect to see the repatriated US submission to the 2018 Venice Biennale of Architecture, Dimensions of Citizenship; a show commemorating the 50th anniversary of the Stonewall uprising; an exhibit of the late painter Tetsuya Ishida; and a show of contemporary Chinese art organised in partnership with Chicago’s Smart Museum. By popular demand, a condensed Ando and Le Corbusier show will reappear for 10 weeks running into April 2019.